Nipping down to your local shop or supermarket by bike can be so quick and simple. It provides your daily dose of physical activity and helps the city keep down congestion and pollution. So why do some stores make bikes into second class citizens? Morrison’s excellence – Ferry Road. 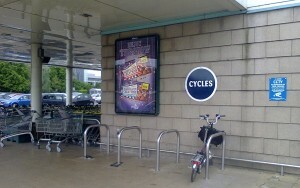 Well spaced Sheffield racks, near door, covered, signed and CCTV!! Morrison’s rubbish – Portobello. 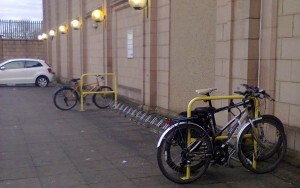 Wheel twisters, resulting in bikes locked to handrails! 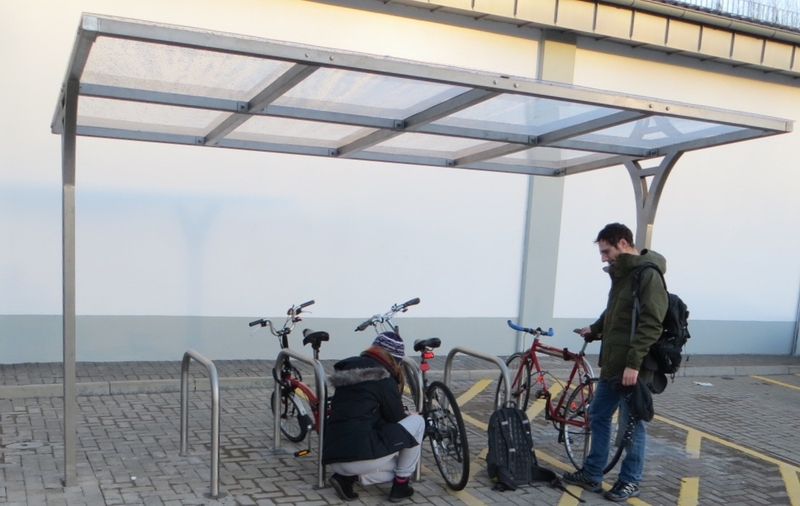 Some stores are exemplary, but we also see existing bike parking ripped out, with no replacement, to extend trolley racks*. We see stores with dreadful access to the site and/or the parking. And some new stores, often the small ‘Express’ shops, have no parking at all, despite Council parking standards. *Examples we know of – though they have now installed replacements following local campaigning – include Lidl [Dalry], Asda [Chesser], and Tesco [Linlithgow]. Growing frustration has led Greener Leith to survey bike parking at local supermarkets and has resulted in discussions on the City Cycling Forum. Last year Spokes Planning Group submitted to the Council a list of ‘onstreet’ supermarkets needing parking, receiving this positive reply. We comment on every relevant new planning proposal and have made a big effort on a few specific bad examples such as Dalry Rd Lidl. An attempt to engage with supermarket Regional Managers to ensure all their stores meet a high standard. Of course, we are a voluntary organisation, so resources are limited! There is no way we can lobby every supermarket, or even survey them all. So we are relying for help on Spokes members and anyone else interested who shops by bike or would like to. Please complete our survey [below] for your local supermarket. If you use more than one supermarket, please complete the survey once for each that you use. We suggest that before you complete the survey you read it, then have a look at your supermarket before completing it. If possible please complete the survey by end of March. Photos would also be useful if they illustrate your reply – please email to spokes AT spokes.org.uk. Preferably no larger than 1MB. Please state clearly the name and address of the supermarket, and start your subject line with ‘Supermarket’. At the end of the survey we ask if you’d be willing to do more – e.g. lobbying at your local supermarket, or something more widely. Please only volunteer if you have the time and enthusiasm! – and note that it may be a while until we can get back to you. Spokes members will be kept updated on the project and we will also announce developments on our website here and/or via @SpokesLothian on Twitter. If you have queries or suggestions please email spokes AT spokes.org.uk. If you live outside Edinburgh + Lothians please do not complete the survey. Why not work with a local group to organise your own – and to make use of the results! But do feel free to email us any useful insights, comparisons, etc. The location of stores. In-town encourages shopping by bike; out-of-town makes it much more difficult to get to and helps shut down town-centre shops. Spokes would like to see levies on supermarkets and all other retail, leisure and workplace destinations with over, say, 10 parking spaces, and based on the number of spaces.